Many overseas Filipino workers face problems with loans. A program for OFWs in Hong Kong is helping change that. 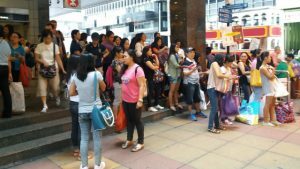 HONG KONG – In a crowded street in central Hong Kong, overseas Filipino workers (OFWs) line up in front of pawnshops and loan agencies. The crowd starts to thicken even before the offices open. For domestic helper Maria Wilma Padura, the scene is all too familiar. The 43-year-old has been an OFW in the city for 18 years, working multiple jobs to raise her family back in the Philippines. “It’s a common problem among OFWs. Many of us are neck-deep in loans. I’ve been taking loans for years before I learned to manage my finances,” Padura said. According to her, the problem starts even before OFWs leave the Philippines. “When you leave the country, you take a loan to pay for the placement fee. You pawn your properties just to pay. When you get here, you have to adjust to the living expenses,” Padura said. Statistics from Hong Kong's Immigration Department show that, as of February 2015, there were a total of 173,726 Filipino domestic workers in Hong Kong. This was an increase of nearly 7,000 for the same period in 2014, when a total number of 166,743 Filipino domestics were recorded. This problem is what the Social Enterprise Development Partnerships Inc (SEDPI), in partnership with the Ateneo School of Government (ASOG), wants to solve in their Financial Literacy, Leadership, and Social Entrepreneurship (FLSE) workshop for OFWs on Sunday, May 29. “OFWs need to manage scarce resources. They need to focus on making their hard earned money productive,” Vince Rapisura, president and chief executive officer of SEDPI. Some OFWs present in the workshop have been working in the city for 20 to 30 years. Before leaving for Hong Kong, the participants admitted that they only wanted to work abroad for up to 10 years so they can be with their families back home. “This is the case for many OFWs. They end up staying too long abroad because they mismanage their finances,” Rapisura said. According to a study conducted by SEDPI, around 57% of OFWs who attend their workshops struggle to meet their daily needs. Some 33% struggle to find funds to finance businesses or sources of income back in the Philippines while 14% struggle to fulfill their financial obligation to their nuclear family. “It’s interesting to note that most OFWs want to create permanent work or sources of income in the Philippines. Their end goal is still to go home and live in the country,” Rapisura said. SEDPI is a capacity-building institution that trains provides training, research and consulting services in micro finance, social entrepreneurship, and financial literacy for OFWs and locals organizations in 27 countries. From an initial capital of P45,000 (US$1,027), the financing company now has P268 million ($5.737 million) based on audited financial statements in 2015. Rapisura encouraged OFWs to increase their investments to achieve eventual financial independence. Active income are earnings gained through work and employment while passive income are received on a regular basis with little effort required to maintain it, like stocks, mutual funds, and real estate rentals. “As a rule, you should use your active income to pay for your needs while you use your passive income for your wants,” he said. Most OFWs, Rapisura noted, barely differentiate between needs and wants. This becomes the root of their and their families financial problems. “You need to change your perspective. You should encourage your family back home that their expenses on needs must come from them and expenses on wants/ goals must come from income abroad,” Rapisura said. Padura was part of the FLSE in 2013. She said the program helped her achieve financial independence. “When I became part of the program, I was still neck-deep in loans. I didn’t know how to manage and budget my resources. I applied what I learned about financial literacy and before I finished the course, I was able to pay off all my loans,” she said. Aside from paying off her debts and helping her sister finish her education, Padura is paying forward and want to help other OFWs currently in debt. She founded the Passi City, Iloilo Association of OFWs in Hong Kong in 2003. In 2015, she organized the Passi City Balik sa Bayan Incorporated to help OFWs who come home start their own businesses and investments. The Iloilo organization is currently undergoing the same FLSE program. Padura was awarded in Outstanding Community Leader Award in 2015 and a finalist of Bayaning Pilipino sa Asia Pacific in ABS-CBN’s Gawad Geny Lopez. The local government of Passi City also gave her a Golden Heart Award and Outstanding Passino Award in March 2016. “I taught my family how to manage their finances properly. I still help them but I don’t pay for all their needs anymore. I learned to say no when needed, which is very difficult for us OFWs,” Padura said. 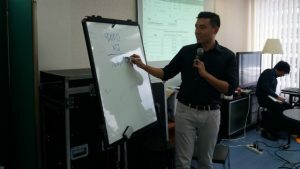 While many OFWs struggle to become financially independent, Padura said it is possible with the right mindset on saving and budgeting. For Rapisura, the training is a service to the country’s modern heroes, who seldom end up broke after spending decades working abroad. “SEDPI would like to harness the power of OFW remittances to contribute to nation building. We need to teach them how to become responsible consumers for their families and themselves,” Rapisura said.